Naraka Chaturdashi is also known as Kali Chaudas, Roop Chaudas, Choti Diwali or Naraka Nivaran Chaturdashi and is a Hindu festival, which occurs on Chaturdashi i.e.14th day of the Krishna Paksha in the Ashweeja month of the Hindu calendar . It is the second day of the five-day-long and vibrant festival of Diwali. This year Naraka Chaturdashi will fall on 6th November, Tuesday. As per the Hindu mythology, the asura (demon) Narakasura was killed on this day by Lord Krishna, Satyabhama and Goddess Kali. The day begins with early morning rituals and festivities follow on. On the day of Naraka Chaturdashi people also perform Abhyang Snan and is considered very auspicious. It is believed that people, who do Abhyang Snan on this day, can avoid going to Narak. Sesame oil should be used for Ubtan (face pack) during Abhyang Snan. Abhyang Snan on Narak Chaturdashi may be one day before or on same day of Lakshmi Puja day as per the English Calendar. On instances when Chaturdashi Tithi prevails before sunrise and Amavasya Tithi prevails after sunset, it is then that the Narak Chaturdashi and Lakshmi Puja fall on the same day. 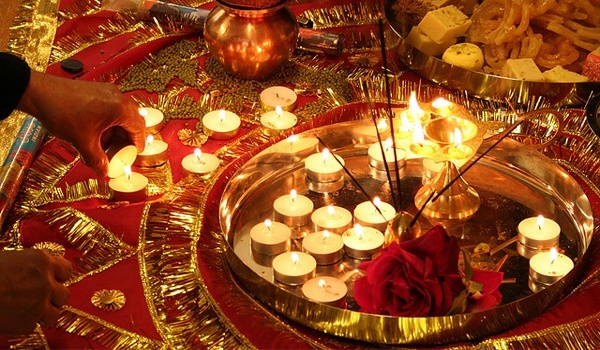 Often Narak Chaturdashi is considered same as Kali Chaudas. However both are two different festivals observed on the same day and Tithi. Depending on the start and end timing of Chaturdashi, the Tithi can also fall on two different consecutive days. Devotees wake up early in the morning, break a bitter fruit and apply oil and kumkum on their forehead (Ubtan) after which they take bath. Devotees break a bitter fruit early morning that signifies the breaking of the head of the demon king- Narkasaur and the kumkum signifies the blood that Lord Krishna smeared on his forehead after gaining victory over the evil. In Maharashtra the rituals are slightly different. Devotees apply a paste of gram flour, fragrant powders and oil on their foreheads and then take a bath early morning. Also firecrackers are burnt so that the kids enjoy the religious and auspicious bath. In the evening the entire town is lit with diyas and candles to celebrate Choti Diwali. Narak Chaturdashi Vrat- This fast is kept by the devotees to please Lord Yamraj (the Lord of death) It is also believed that lighting lamps on this day kills the negative energies. Devotees bathe early morning and light earthen lamps to worship them. It is believed that the light of these lamps destroys all the negativity around. Women observe fast the entire day to gain beauty, therefore it is also known as Roop Chaturdashi. In the evening Lord Yamraj, Goddess Kali, Lord Krishna and Goddess Lakshmi are worshipped. It is believed that this fast helps you to obtain a positive and enhanced life ahead.